Two-and-a half millennia after it was created, Homer's Odyssey remains one of humanity's most memorable adventure stories. In this re-creation of Homer's classic as a young adult novel, we see the aftermath of the Trojan War through the eyes of Alexi, a fifteen-year-old Trojan boy. Orphaned by the war and enslaved by Odysseus himself, Alexi has a very different view of the conquering heroes of legend. Despite a simmering anger towards his captors, Alexi gradually develops a grudging respect for them. As the Greeks fight off the angry Cicones, weather a storm that pushes them far beyond charted waters, and nearly succumb to the blandishments of the bewitching Lotus-eaters, he realizes that they are not the demons they were said to be, but people like himself. At the same time, Alexi's quick thinking, bravery, and the healing skills that he learned from his father prove to his captors that he is no ordinary slave. His key role in their escape from the Cyclops earns the respect of his master, Odysseus, and a striking discovery during their escape gives his life a newfound purpose. 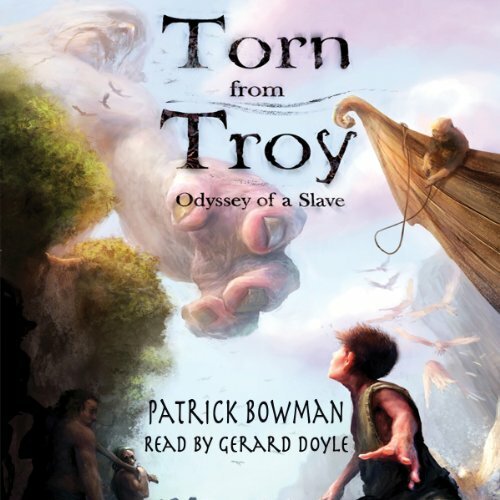 Straddling the boundary between historical fiction and mythology, Torn from Troy is written in a hard, realistic style and brings to life the travails of a bronze-age slave of the Greeks in a form that will appeal especially to teen boys. While this book is the first volume of the author's Odyssey of a Slave trilogy, it is a compelling and fully-realized work on its own. Many have used Homer’s Odyssey and told the tale differently – focusing on different aspects of the tale or changing the time period and place. Patrick Bowman takes the tale of Odyssey and tells it from the viewpoint of a fifteen year old boy named Alexi. Alexi sees his sister killed and then he’s captured and enslave by Odyssey who claims Alexi as his own and thus begins Alexi’s adventure. Like most 15-year-old boys, Alexi must learn to curb his tongue or it means certain death. Faced with life as an orphan and a slave, Alexi learns quickly to think on his feet and in doing so impresses Odyssey. Alexi witnesses first-hand the clash between the Cicones, experiences the deadly storm that knocks their ship beyond the boundaries of any known map; he tastes and almost surrenders to the enticing Locust eaters and helps the Greek soldiers and his master escape the mighty Cyclops. Alexi is a captivating young man; his talents are brought to the forefront by his constant need to survive and the situations he finds himself. His fast wit and bravery is fascinating. Bowman takes Alexi and makes him real to his audiences. While the adventure is based upon apiece of historical fiction and mythology, the listener can lose themselves in the telling of the story as it spins out thus connecting with Alexi. Bowman uses rich vocabulary to describe the battles and chaos. He does not rush through the telling of the Odyssey, he takes time to show the relationships within the Greek army, the other slaves and Alexi. The style in which it is written is fast paced, action packed and will appeal to most. I was delighted to learn that this is but volume one in a short series. Gerard Doyle, narrator, did a delightful job of telling the story. His voice was soothing and reflected how I envisioned a 15-year-old boy who has not yet gone through puberty would sound. Immersing himself in the story, Doyle gave a captivating performance. He was like the icing on the cake so to speak. This is a superbly done story by both the author and narrator. Its appeal is to a wider audience, although young adults will love it more so. This is one of those “don’t miss” adventures. There were no production issues, everything was clear and smooth. This series re-imagines parts of the Odyssey through the eyes of a young Trojan captive. While this novel does not retell every episode of the Odyssey and it also strays away from some of the details of the standard version original, it does cover several of the highlights in greater detail. What is best about the story is that the main character Alexi is as feisty and clever as Odysseus himself, if not more so. This is one of my favorite genres and there are many authors writing in this form including Madeline Miller, Rosemary Sutcliff, Margaret Atwood, David Malouf, Zachery Mason, and many others. But this lighthearted take is one of the most entertaining and perfect for Homer fans of all ages. It helps to have read the Odyssey and I recommend Emily Wilson's new translation which is bright, fresh, contemporary and crisp as well as being very well researched and, unlike many other translations, is true to the original in that it is metrical, that is in iambic pentameter which works better with the English language (Homer's was written in dactylic hexameter which works well in Greek). The entire trilogy is a delight and the pleasure is enhanced by the excellent narration.